Watch out for bees in the Huntington Beach area. A woman was hospitalized with multiple stings after a swarm of bees attacked her in Huntington Beach on Saturday morning, authorities said. The Huntington Beach Fire Department received a call shortly after 9 a.m. and arrived to find bees “swarming all over” the woman, said Capt. Robert Culhane. “They were really aggressive. As soon as we came on, they started coming after us,” Culhane said. He suspected the insects were Africanized honeybees because of their size and aggression. Instead of stinging immediately, the bees would fly into the victim, firefighters or other targets repeatedly, he said. Firefighters tried to deter the bees with a water-foam mixture — the foam strips the bees of their ability to fly, Culhane said. When they were able to approach the victim, they found even more bees “meshed into the hair,” he said. The firefighter operating the hose was stung twice but did not need medical attention, Culhane said. The woman was in her 40s, and her condition was unknown, said Huntington Beach Fire Capt. Steve Teasdale. A Public Works employee examined the area after the attack and didn’t find any bees, Culhane said. People who are swarmed should stay calm, and call 911 if in need of medical attention. Thousands of bees have invaded a Huntington Beach home, and the residents on Thursday was calling the experience “surreal.” Chip Yost reports for the KTLA 5 News at 6 on June 15, 2017. 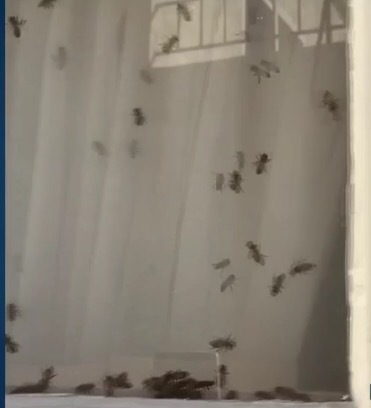 A Huntington Beach couple had to cope with hundreds of bees that took over their home, swarming over windows and buzzing around in nearly every room. 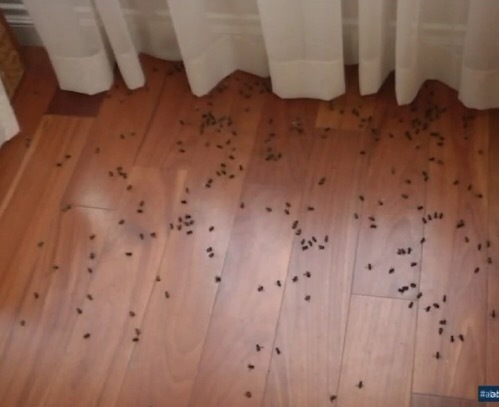 Noreen McLaughlin said she first noticed one or two bees in her home on Wednesday, but soon discovered what appeared to be just a solid dark wall of bees in one room and smaller swarms covering the windows and flying out the chimney. She and her husband Jim used bug spray and taped up the fireplace, trapping some of the bees inside while they waited for help from an expert. A helpless woman partially covered with angry bees suffered numerous stings Saturday after being attacked in Huntington Beach, authorities said. Bees were even buzzing in her hair when firefighters came to the rescue, but the bees then stung one of the firefighters. A search of the area failed to turn up an active hive, so it was not known whether there was a hive nearby or if it was a passing swarm, Teasdale said. Like many insects, bees are seasonal in nature. They’re typically the most active between March and October, which you’ll recognize as the same time of year most people are enjoying the outdoors. You should also know that bees can be rather unpredictable. Obviously, if you poke the hive with a stick, you’ll be attacked, but many innocent activities can trigger a swarm. Sometimes brightly colored clothing or the glint of jewelery can be perceived as a threat. The scent of certain colognes and perfumes, sudden movements and vibrations, as well as loud sounds can also provoke them. It’s also important that you never swat at a solitary bee that may be buzzing around you. As annoying as they may be, killing a bee will often cause it to release a pheromone that will alert his comrades. … Like many insects, bees are seasonal in nature. They’re typically the most active between March and October, which you’ll recognize as the same time of year most people are enjoying the outdoors. You should also know that bees can be rather unpredictable. Obviously, if you poke the hive with a stick, you’ll be attacked, but many innocent activities can trigger a swarm. There really are killer bees but statistically they aren’t a big problem. They have killed people. Africanized honey bees are shown on a tree limb near the Texas A&M Research and Extension Center. A hive of approximately 40,000 Africanized honey bees killed a farmer near Waco, Texas, on Saturday, after he drove past their hive on a tractor. The victim was identified Monday as Larry Goodwin of Moody, Texas, the Waco Herald-Tribune reports. McLennan County Chief Sheriff’s Deputy Matt Cawthon told the paper that Goodwin bumped into an unused chicken coop where the hive was living, prompting them to give chase. Goodwin dashed 50 feet to a garden hose, which he attempted to use to dispel the bees. A woman identified by KCEN-TV as a neighbor attempted to help, but was stung repeatedly, as were volunteer firefighters who responded. Allen Miller was called to remove the bees from Goodwin’s farm. Miller, the owner of Bees Be Gone, told U.S. News he typically exterminates six hives of Africanized bees per year. In the past 30 days alone, he said, he’s exterminated six hives. Miller kills the bees where he finds them, using various insecticides that are safe for humans 2 hours after application. “I have a 90-day warranty, so I’m real serious,” he said. When they cover his body and sting through his gloves and clothing, Miller retreats to his car and turns on the air conditioning, which causes the bees to flee. That’s a good tip. Get in your car and blast the AC.